This literary masterpiece revives the ideological debates of the interwar period through the journal of a Romanian Jewish student caught between anti-Semitism and Zionism. Although he endures persistent threats just to attend lectures, he feels disconnected from his Jewish peers and questions whether their activism will be worth the cost. Spending his days walking the streets and his nights drinking and conversing with revolutionaries, zealots, and libertines, he remains isolated, even from the women he loves. From Bucharest to Paris, he strives to make peace with himself in an increasingly hostile world. 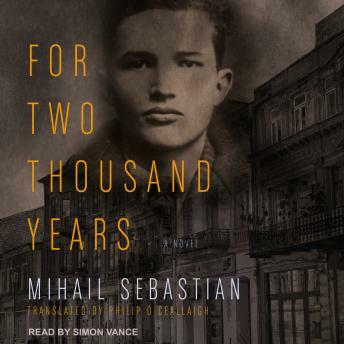 For Two Thousand Years echoes Mihail Sebastian's struggles as the rise of fascism ended his career and turned his friends and colleagues against him. Born of the violence of relentless anti-Semitism, his searching, self-derisive work captures a defining moment in history and lights the way for generations to come-a prescient, heart-wrenching chronicle of resilience and despair, resistance and acceptance.